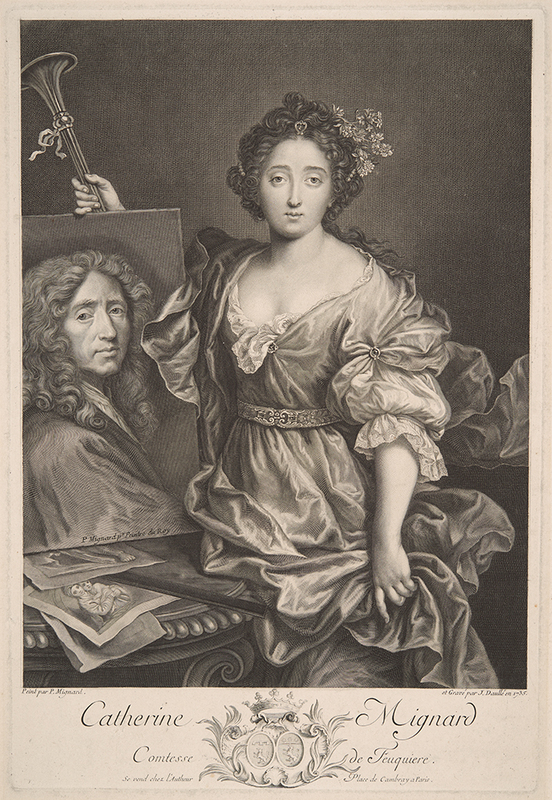 The image depicts Catherine Marguerite Mignard holding a painting of her father, the painter Pierre Mignard. Bibliography: Portalis and Beraldi 57 ii/ii (vol. 1, p. 671); Le Blanc 29; Courboin (vol. 2, p. 32) unnumbered; Firmen-Didot 333 (vol. 1, p. 105); Delignières 47. Portrait of Catherine Marguerite Mignard, Comtesse de Fouquière, Daughter of the Painter Pierre Mignard, . Engraving on laid paper. Second of two states. Plate: 470 x 315 mm (18.5 x 12.4 in.). DAC accession number 1947.D1.6. Gift of George W. Davison (B.A. Wesleyan 1892), 1947. Open Access Image from the Davison Art Center, Wesleyan University (photo: M. Johnston). http://dac-collection.wesleyan.edu/obj4057 is a persistent link to this page with no user-session information.